Renee Mobbs – Burlington, Vermont litigator and banking and health care lawyer representing clients in civil disputes. Renee Mobbs joined the firm in January 2016 and is a principal of the firm. Her practice focuses on civil and probate litigation, banking/financial services, and health care law. 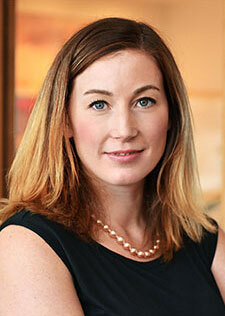 She also works with the firm’s commercial transactions group. Since 2015 Renee has been recognized by Super Lawyers magazine as one of New England’s Rising Stars in litigation. Regularly advise banking and financial services clients on regulatory compliance matters, day-to-day operations, foreclosure and bankruptcy matters. Assist health care clients, including residential care homes and nursing homes, with mergers and acquisitions, licensure, regulatory compliance, drafting of operational documents, and day-to-day legal matters. Regularly advise business and individual clients on probate administration and probate litigation matters, including but not limited to filing and protection of creditor claims and representation of administrators as well as heirs. Successfully represented local mail-order pharmacy with sale of substantially all of its assets.